How do you use your 529 plan to pay education expenses? Funding a 529 was a great choice, but withdrawals come with their own set of choices. Make smart decisions and you can reap the full benefit of your diligent savings. Most importantly, avoid withdrawal penalties and taxes by reading up on eligible education expenses. While the IRS hasn’t definitively ruled on this issue, a common practice is to withdraw 529 funds in the same tax year the educational expenses were incurred, and save receipts. Consider how much of your balance you want to use right away, versus saving for future years. If you’re using 529 funds for the right expenses at the right time, then the rest is a matter of making the request. Generally, 529 plans can issue a distribution to the account owner (the parent), the beneficiary (the student), or directly to the payee (typically, the school). The first option gives you the most control over the funds, but could result in an IRS notice seeking clarification when your 1040 doesn’t show you paid taxes on the earnings. Sending the check directly to the student, who then pays the bills, can work well for students able to handle that added responsibility. Finally, you can send the funds directly to the school. 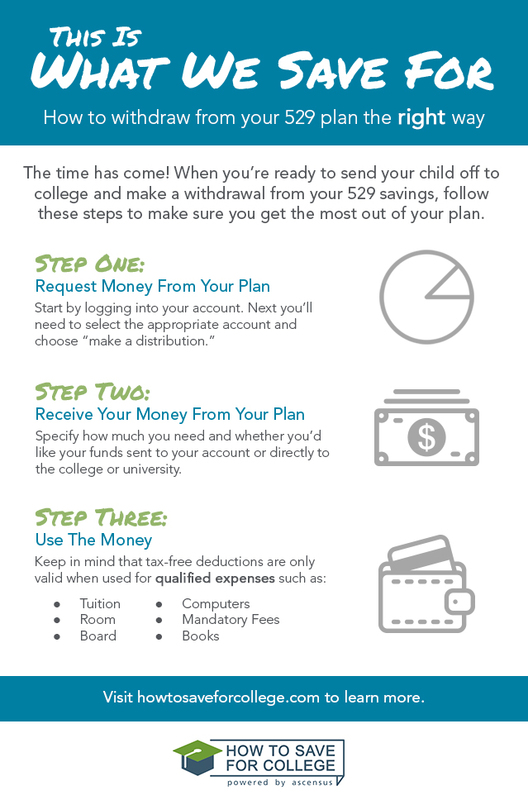 In all three cases, make sure you allow yourself and your 529 plan provider enough time to get the funds to the school.